I did a lot of props and costume pieces for my larp at this year's Origins (Aethernauts: The Space Between - Steampunk Edition), one of which was the Steampunk Phonograph, which I posted about earlier, and another was the Space/Diving Helmet which was a major build that I will be posting more about soon. But I also did some smaller items. In hindsight, I wish I had spent a little less time on the props and costume pieces and a little more time on some other elements, but all in all the game ran pretty well. 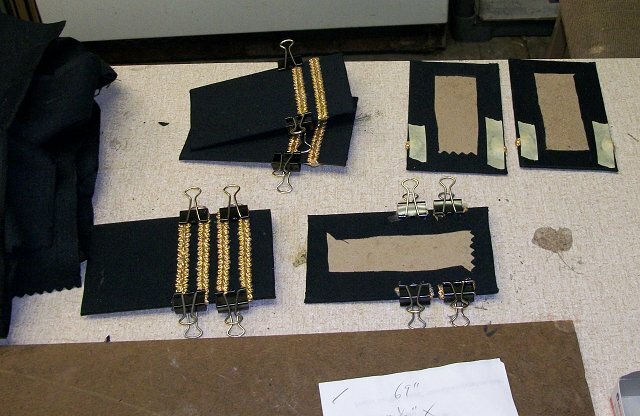 Many of the characters in this larp were Victorian era military officers, so I made some uniform pieces and accessories for them. First lets look at the simplest of the items. This is a plastic toy spyglass that I found at a discount store for about a buck. I made quick white canvas belts with brass buckles for the officers out of some old canvas webbing I had. 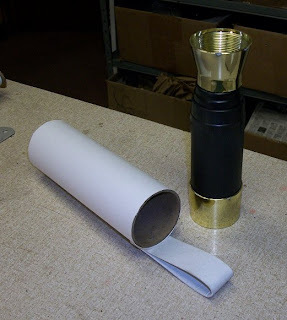 I wanted accessories to match, so I made a spyglass holder out of a cardboard mailing tube wrapped in white butcher paper. 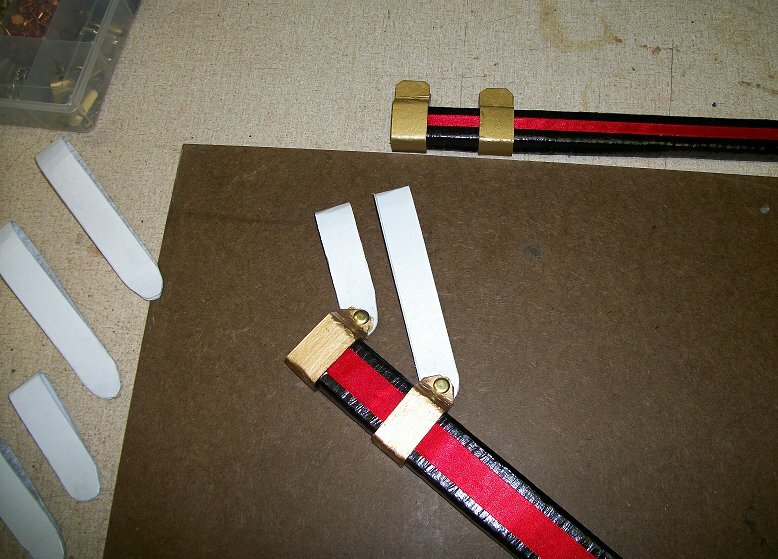 The belt loop is chip board wrapped in white paper. It was attached to the tube with some glue and a heavy duty stapler. Next up is this pistol holster. 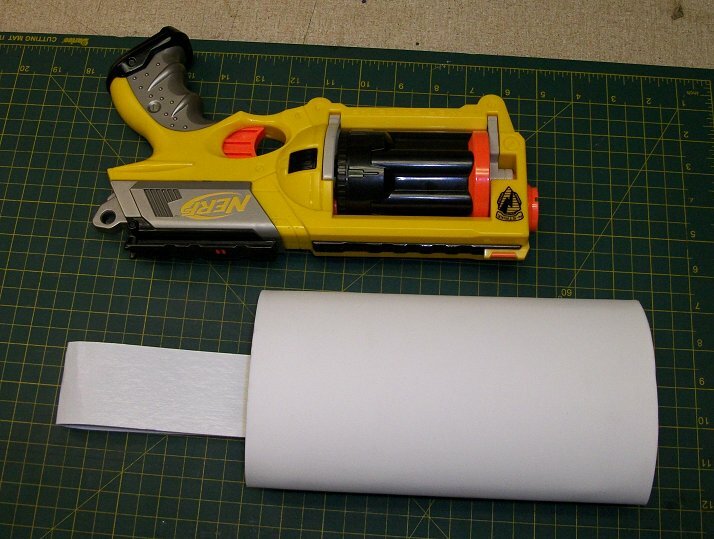 I had planned to make a steampunk rifle, but I didn't have the time. Instead, I decided to use my Nerf Maverick with the Steampunk paint job (the one pictured is not painted, it was just for test fitting). 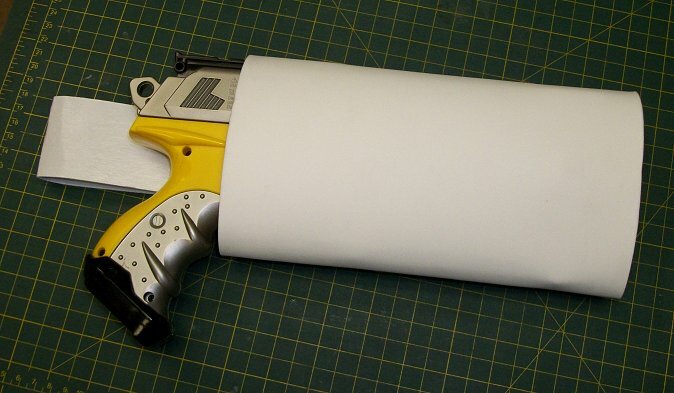 I wanted the body of the holster to be soft and flexible so that it wouldn't scratch the paint on the gun, so I used a sheet of white craft foam. This I glued into a cylinder, and added a belt loop made out of chipboard in the same manner as the spyglass holder. 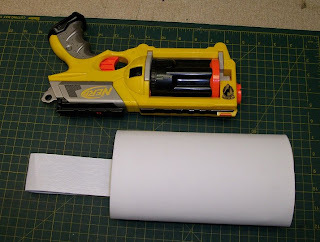 I made sure the cardboard for the belt loop ran the full length of the holster to give it more form and strength. 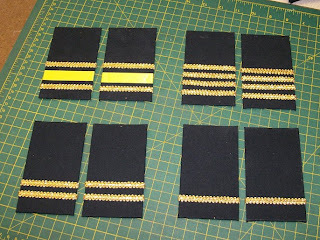 A very simple and inexpensive costume piece that easily differentiated the military personnel from the other characters, without having to create full uniforms, was to create rank insignia epaulets. These were made from just a piece of rectangular chipboard covered in black cloth. 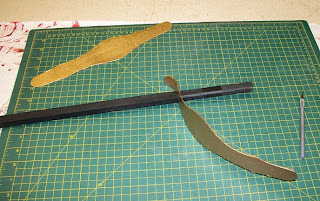 I then glued on strips of gold knotted trim and bits of ribbon from the fabric store. These would then be stuck onto the player's shoulders with a bit of double sided tape. The epaulets I made for the retired Major-General were a little more complicated, but similar. 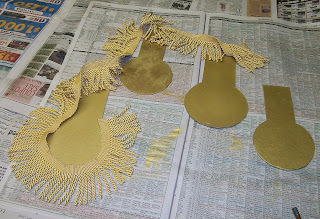 I used a bit of gold satin fringe sandwiched between two pieces of chipboard (one slightly larger than the other). These ones were round on the ends to create the shoulder cup style of epaulet. The chipboard was sealed with mod podge and painted gold. 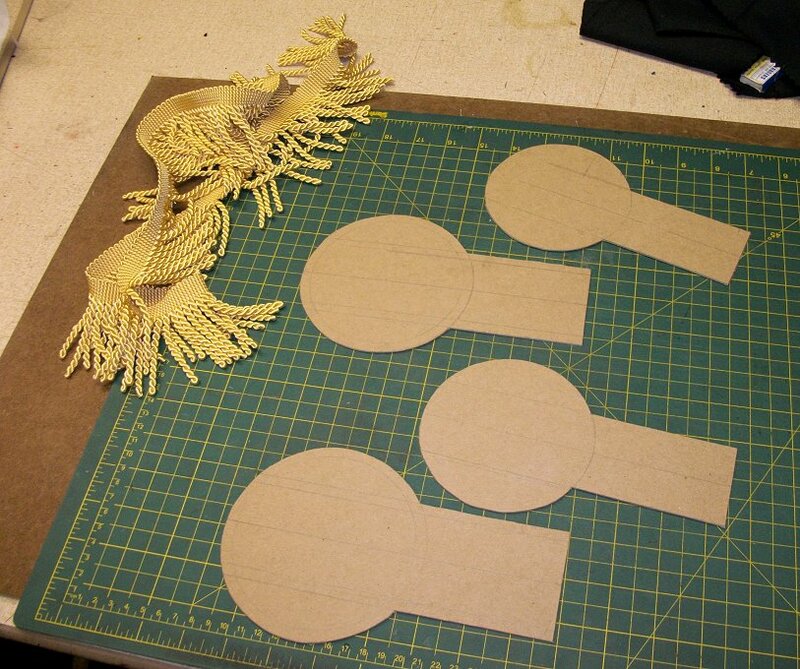 The fringe was arranged around the cup and glued down to the larger piece. 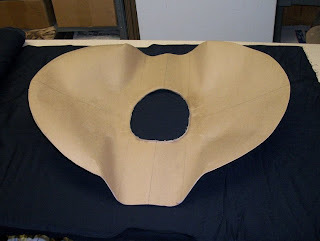 Then the smaller piece was used to cover this. The upper (smaller) piece also had some black ribbon added for additional decoration. 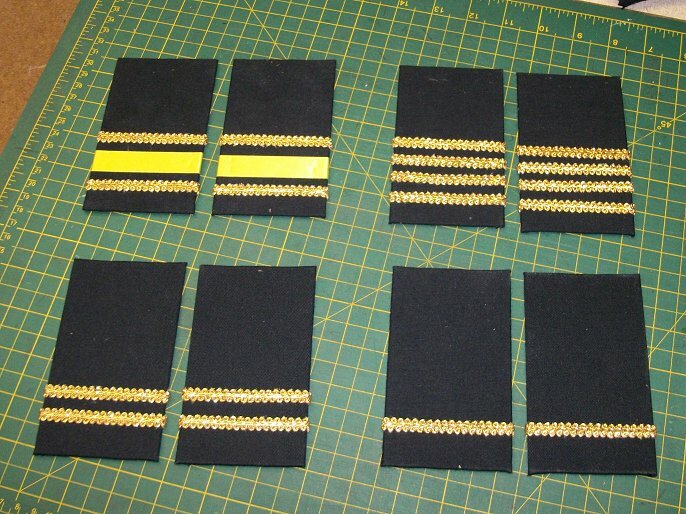 None of these look very much like actual rank insignia from any country or period, but my project did not require period accuracy. They were only meant to convey the idea of a military uniform on a non-existent budget. Some of the military officers was also given an officer's sword. I wanted these to be very cheap and simple. They turned out to be a little more complicated to make than I expected, but they looked pretty decent. After looking around the shop for a few minutes, I found a few pieces of wood trim that would work nicely. They weren't all exactly the same size, but oh well. I cut them all to the same length and trimmed down around the handle so that a piece of 3/4" pvc pipe would fit over the end. The pvc would serve as my handle. I wouldn't have to wrap or paint it, since I was going with a white trim theme. It would look like an ivory handle. I shaved down the tips into a rough point so that it seemed more sword-like, but I left the edges flat and made sure the points were quite dull so that no one would get hurt. 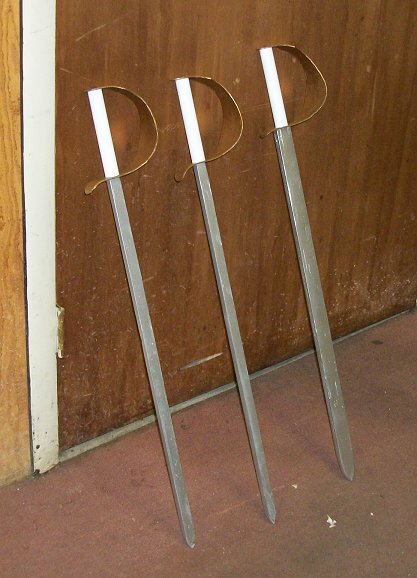 The convention actually has rules against using these kinds of props in games, for safety reasons, but as long as no one gets hurt, they are seldom enforced. 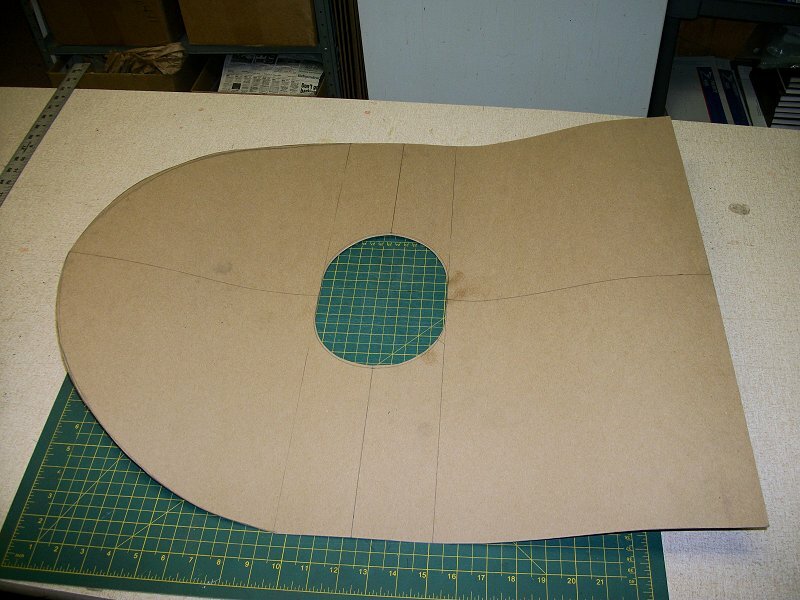 I created a paper template for the hand guard and traced it out onto chipboard. This was then sealed with mod podge and spray painted gold and slid over the end of the handle. The blades were primed and painted with silver. 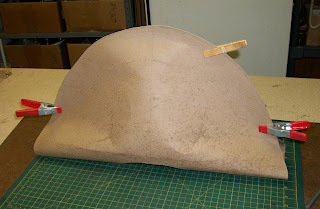 Some glue and an upholstery nail at the pommel held the hand guard in place. 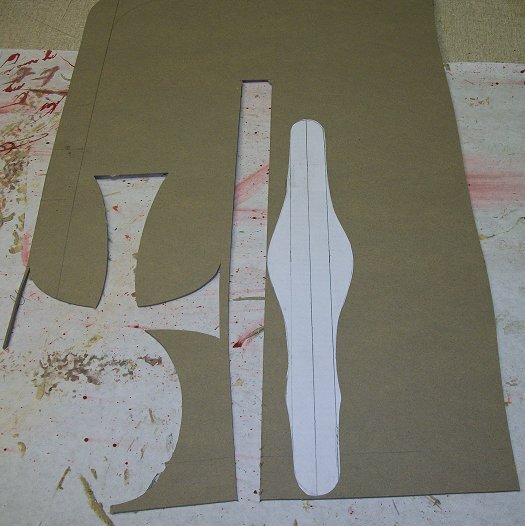 The scabbards were made from corrugated cardboard folded into a box that would fit around the blade. I left both ends open for simplicity. I wrapped the whole thing in masking tape and painted it gloss black. 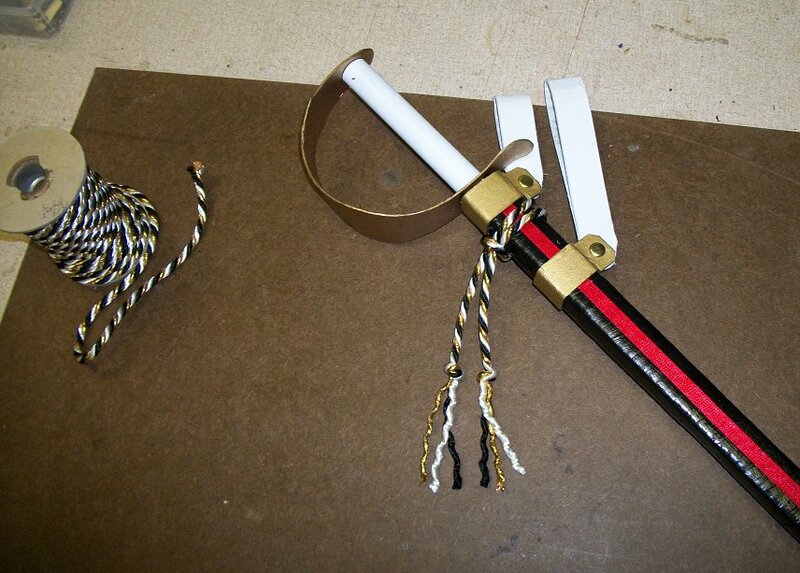 What really sold it as a scabbard was the piece of red ribbon trim that I glued down the side as an accent. 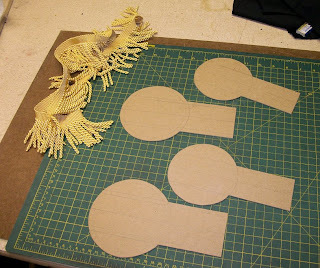 I created belt hangers out of painted chipboard and a brass rivet. Chipboard wasn't really strong enough for this, and most of the belt hangers ended up broken by the end of the game, but they were only needed for the one event. The whole thing was topped off with some decorative cord tassels. The most difficult of the military costume pieces was the bicorn hat, that I had originally intended for the ship's Captain, but ended up giving to the retired Major-General. 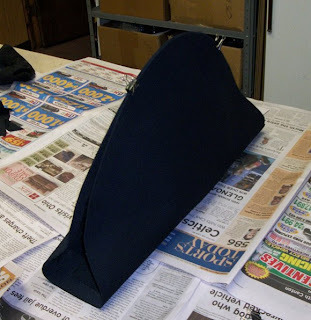 I had to do a little digging on the internet for ideas on how to make the hat. Most helpful was posting on the Replica Prop Forum where I found out the proper name for such a thing, which then led me in the right direction to finding reference images and such. Again, this needed to be done on the super-cheap, so back to my good old friend, chipboard. At $1.75 a sheet, it is hard to beat. 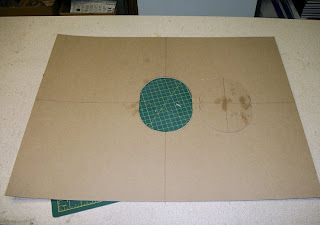 I sketched out a rough circle on the chipboard, and at the center of it I cut out an oval with measurements that roughly matched the dimensions of my head. 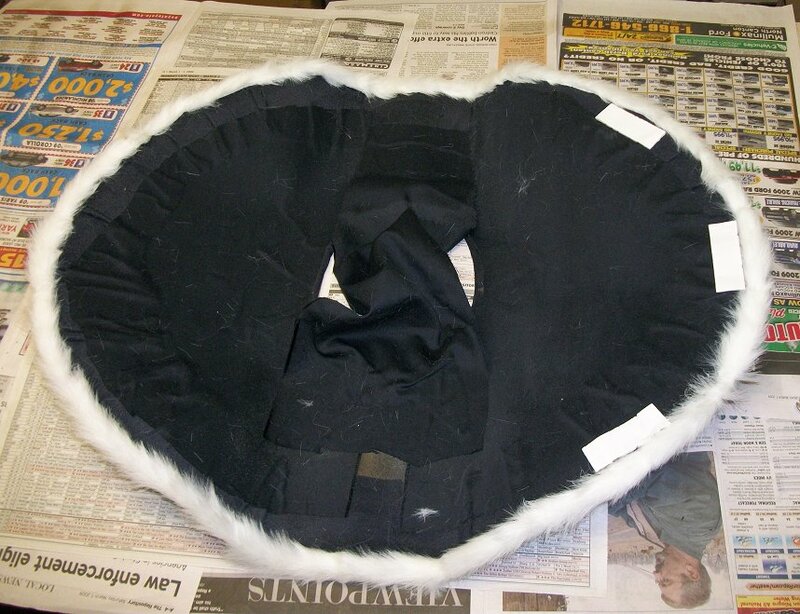 I made it a little tight on purpose, figuring it is easy to remove material, not so easy to put it back. Next came the shaping of the chipboard. This was harder than I thought it would be. It took several days of pushing and prodding and pinning with clips and clothes pins to get it to where I wanted it. The best work was done after I realized that the chipboard would form well after it was wetted down with a misting of water. That made it easier to bend without creasing, and it allowed the board to mold to the desired shape and stay there after it dried. 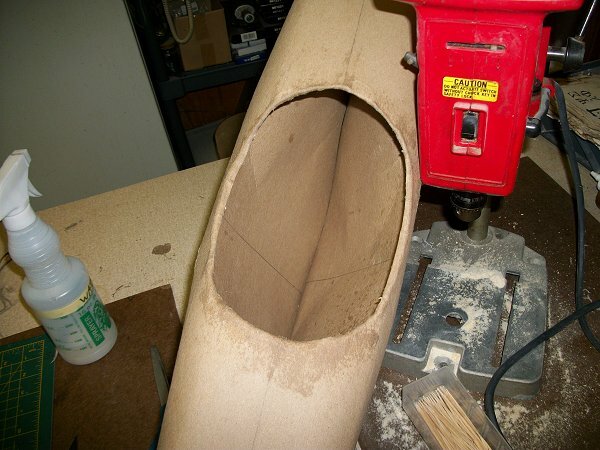 After shaping, I needed to cover the chipboard with something. 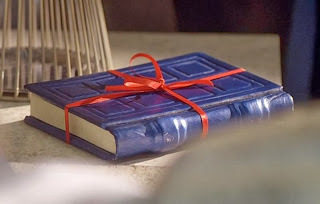 I was hoping to find some sort of spray on flocking material to give it a cloth like texture, but I was unable to find anything like that locally. 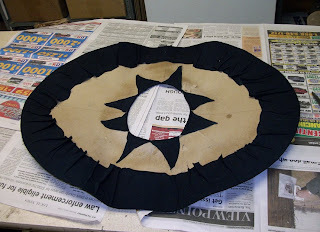 I briefly considered just spray painting it, but ultimately decided to just cover the thing with cloth. Fortunately, I had stocked up on cheap black cotton cloth back when Wal-Mart had a fabric department. I applied the cloth with spray glue and was careful to avoid wrinkles. 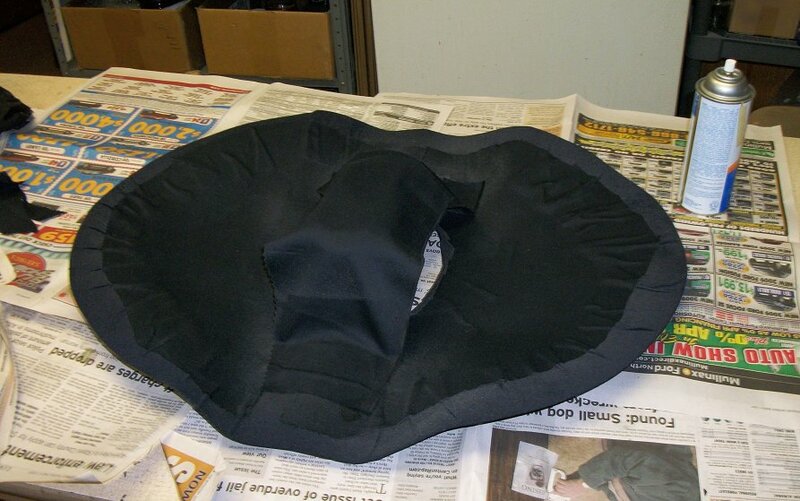 After realizing that you could see the glare form my bald head through the hole in the front during a test fitting, I added a swath of black cloth loosely across the head opening, to prevent this. 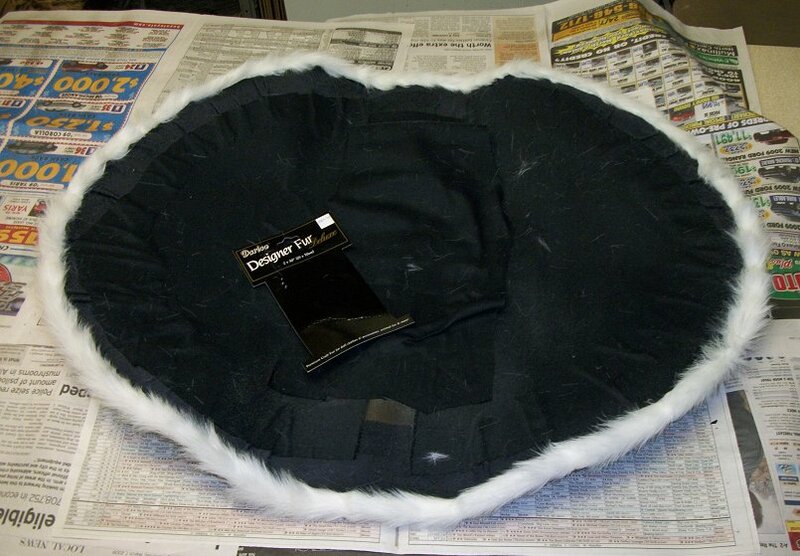 As the final detail, I added a trim of fake white fur all around the edges. I considered some sort of ribbon or decoration on the side too, but decided not to. 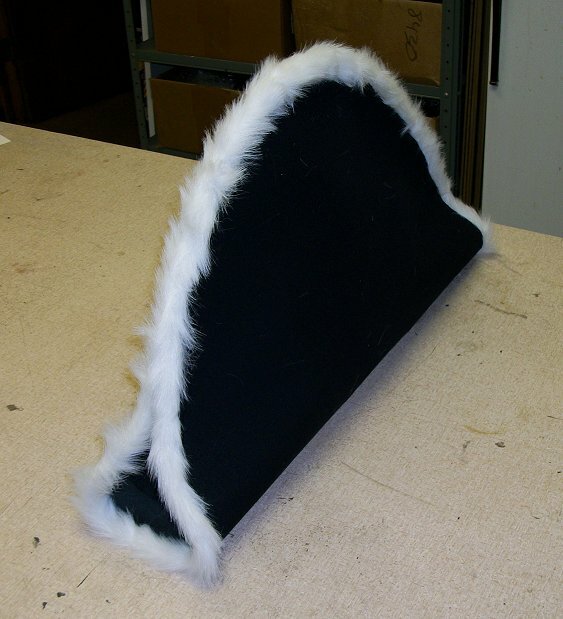 The two sides of the hat was then closed up with a few pieces of double sided foam tape. Here is a pic from the larp so you can see some of the props in action. 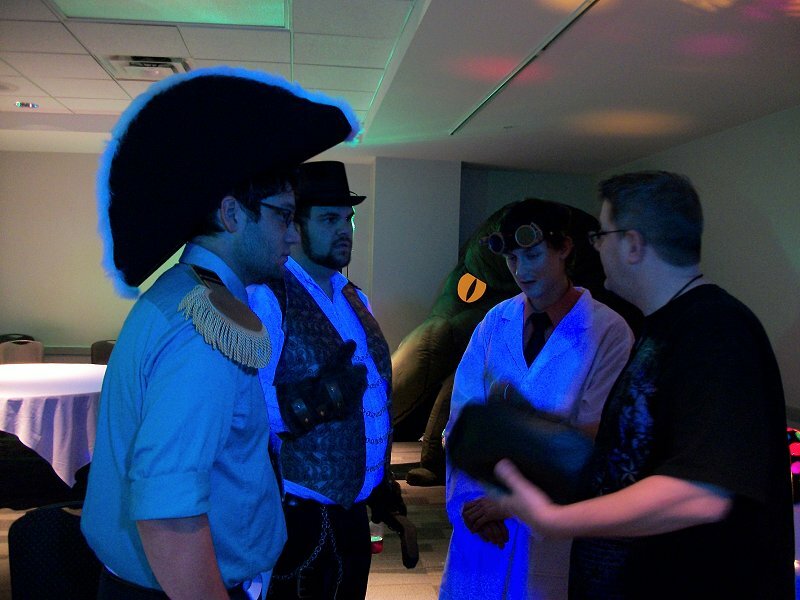 More pics from the larp will be posted on RogueCthulhu.com (eventually). So, the good news is, that after three years of being laid off from work, I have finally secured a steady day job that will let me catch up on some long over due bills. The bad news is, that I am now working 60 hours a week at said new job, which leaves me very little time to work on any projects or make any blog posts. I haven't even managed to list the three Cthulhu books from my last post on eBay yet. Furthermore, I was pretty scared there for the first few weeks. My new job is very physical, and it has taken a toll on my hands. Practically overnight I developed near crippling arthritis in both hands. OK, maybe more like moderate arthritis, but it sure felt crippling. Pain all the time, can't move my fingers in the mornings, loss of sensation and loss of fine motor control. Just holding a hobby knife was near impossible. Any kind of crafting was right out. Since then it has gotten better, most of the pain is gone and I have regained some sensation and a good bit of motor control, but I'm still suffering from severe joint stiffness in my fingers. Every morning I take three Advil and soak in hot water for 10 minutes just to get them moving so that I can get dressed. So that's why there have been no new posts in the past month. I still have a lot of material to post from my Origins prop projects, even if I can't get much done in the workshop for now. So during one of the four hours I have to myself each day, I will try to get some of it posted soon.